French restaurants and their air of je ne sais quoi seem to generate much excitement in HK, leaving people all hot under the collar. 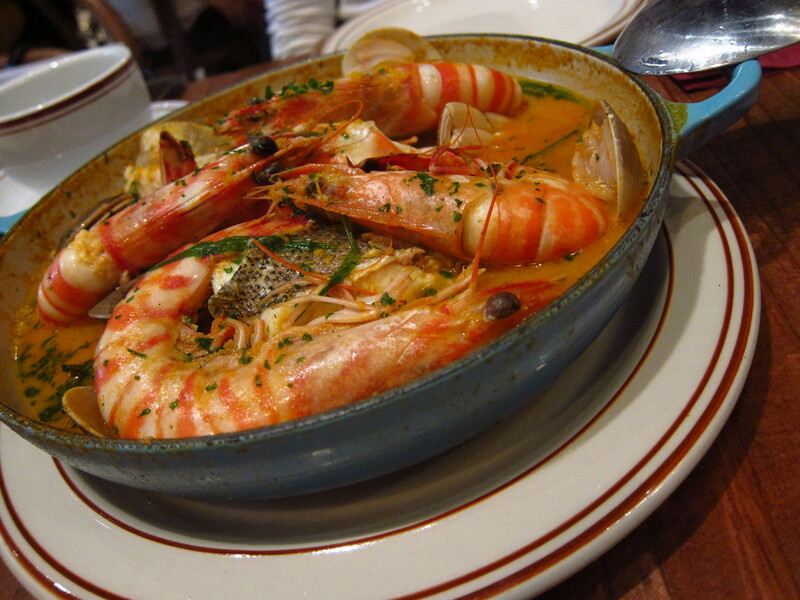 With a bevy of unpretentious French eateries popping up around town of late (e.g. 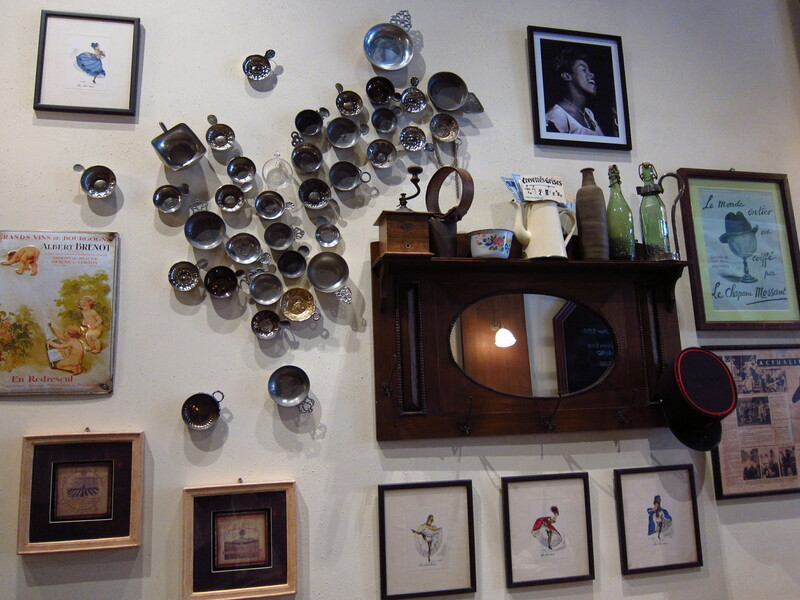 La Cantoche, Les Fils a Maman), Bistro Du Vin in Kennedy Town is the newest addition to the scene. Created by Les Amis Group who also own Piccolo Pizzeria and Cepage, it’s already attracted a fair bit of attention with its rustic, home-style and finely executed dishes. Kennedy Town, like the other hip foodie hotspot Tai Hang, is starting to come into its own and Bistro Du Vin is another reason to hop on that tram, enjoy the ride west and explore the area. The interior is welcoming and eclectic with a lovely collection of unconventional but distinctly French antiques; delicate drawings of can-can dancers, Mickey Mouse vintage prints and tastevins (small metal cups used in times gone by to assess wine by candlelight) adorn the walls in a charmingly haphazard manner. The owner’s passion for wines from the Burgundy region is evident by the extensive wine collection housed at the back of the restaurant, which in itself adds a decorative flair to an establishment, capturing the essence of a Parisian bistro quite successfully. The interior creates the right ambience, but what about the food? 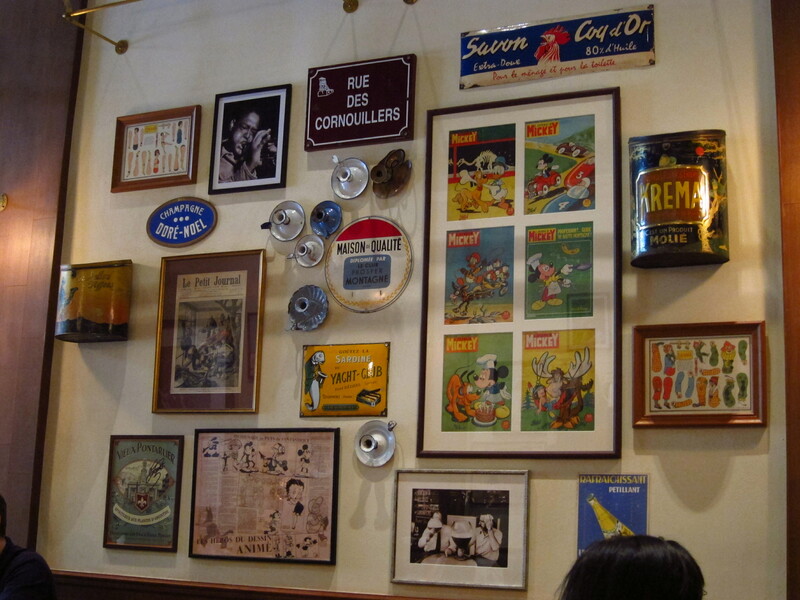 The compact menu has a good selection of ‘Les Charcuterie, Pate et Rillettes’, ‘Les Entrees, ‘Les Oeufs’ and ‘Les Plats Prinicpaux’, as well as the all-important ‘Les Desserts’. 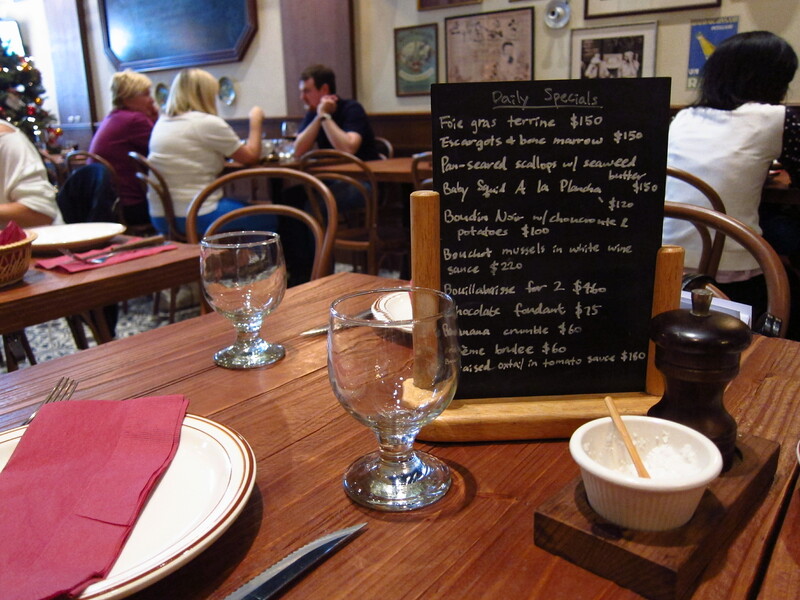 A mini chalkboard at each table showcases the appealing selection of daily specials; that day, I sampled the baby squid a la plancha as well as the bouillabaisse. 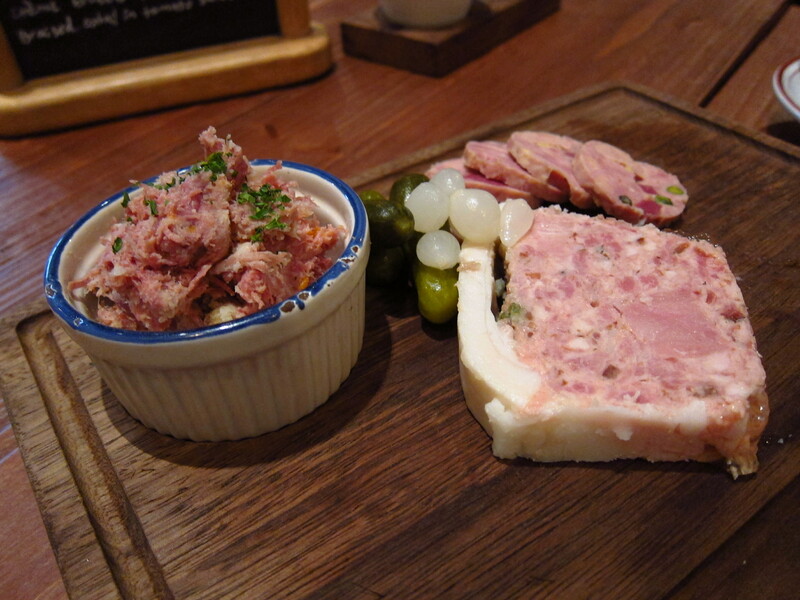 But before plunging into the mains, the homemade pork paté, duck paté and duck rillettes were an absolute must. All three were superbly prepared, with both the pork and duck paté vying for attention from my knife! The duck paté was beautifully smooth and rich, and was scrumptious with the sourdough bread. Given a choice, I normally prefer rillettes as I’m a particular fan of its more rustic texture, and in this case the fat-encased duck rillettes came out top, with me eating it on its own (no bread required!) and having to stop the waiter from whisking it away. 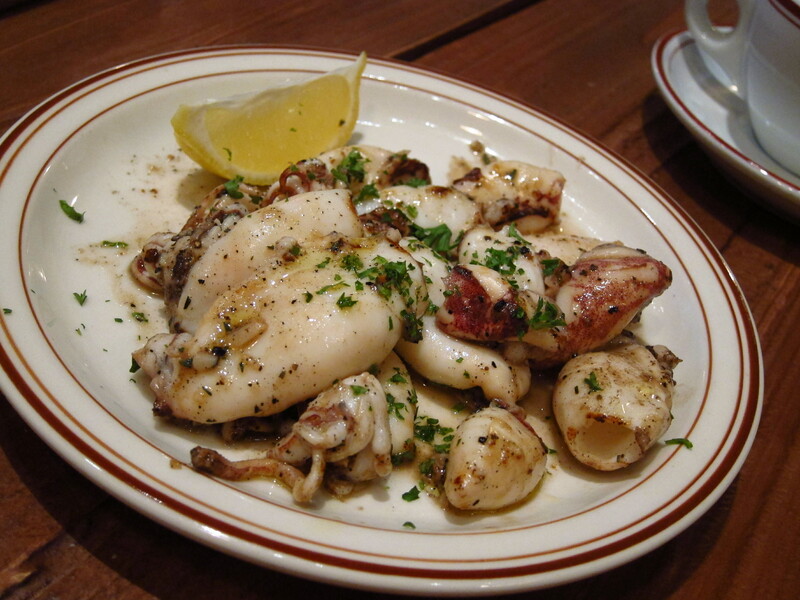 The baby squid a la plancha were delightfully fresh and I adored the simple seasoning and squeeze of lemon that brought out the flavours. This was definitely one of the highlights of the meal. Although the bouillabaisse, presented with aplomb in a blue Le Creuset dish, was teaming with sea life (mussels, prawns, crabs, fish), the thin broth was lacking the robust flavours that would have reflected the many hours of stewing – though it still makes for a great way to fight off our current cold spells! Egg-lovers will be interested in the ‘Les Oeufs’ section and I would be surprised if diners didn’t enjoy the home-salted brandade and soft egg with Espelette Hollandaise sauce. 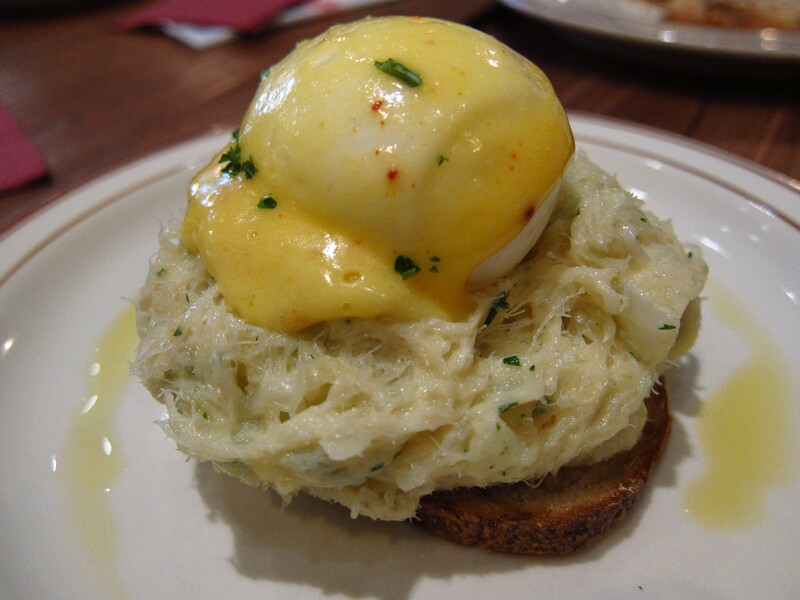 The brandade, traditionally an emulsion of salt cod and olive oil, was perfectly salted and tasted heavenly with the runny yolk and Hollandaise sauce. Espelette pepper is a variety of chili pepper that was originally cultivated in Espelette in the Basque region but is now also grown in other areas; the addition of the pepper here gave the hollandaise a slight smoky tang and sweetness, rather than the heat or strength one might expect from a chilli. 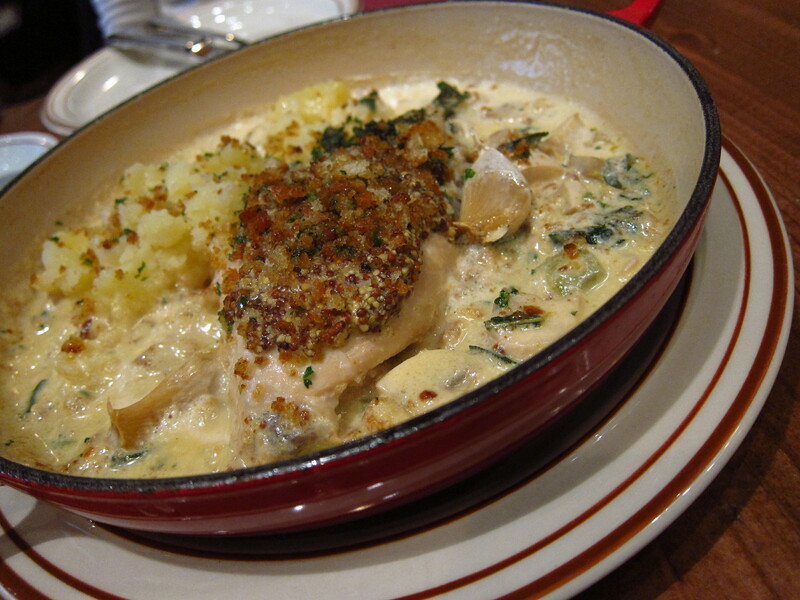 The usual French fare of coq au vin or duck leg confit caught my eye on the menu but upon spotting rabbit, I knew this was a dish worth checking out, especially as rabbit is not common in Hong Kong. The rabbit leg was tender with a subtle game taste. Generous amounts of white wine had gone into the white sauce and the pommery grain mustard was just a tad too piquant, but otherwise the dish’s flavours combined well on the palate. The classic apple tart with vanilla ice cream was a scrumptious end to the meal and beautifully made. 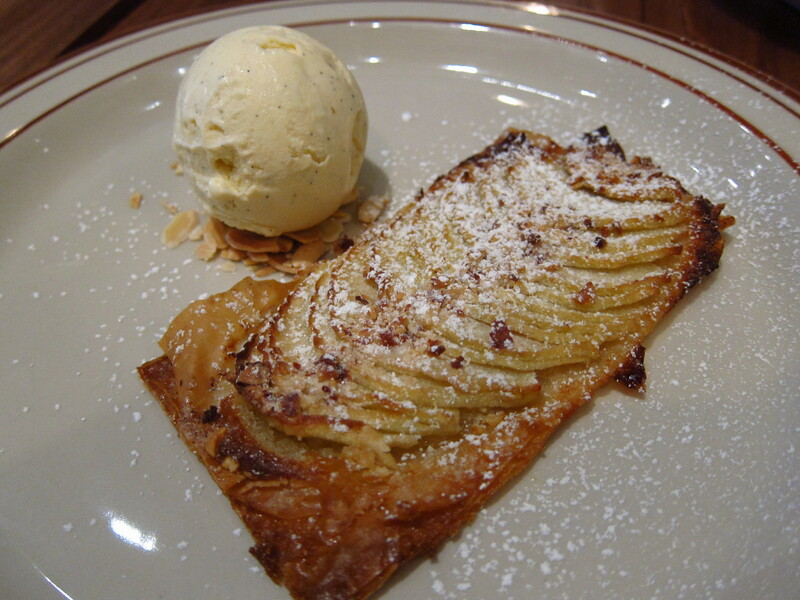 I loved the crisp flaky pastry with slices of still juicy apple, finished off with an attractive dusting of sugar. 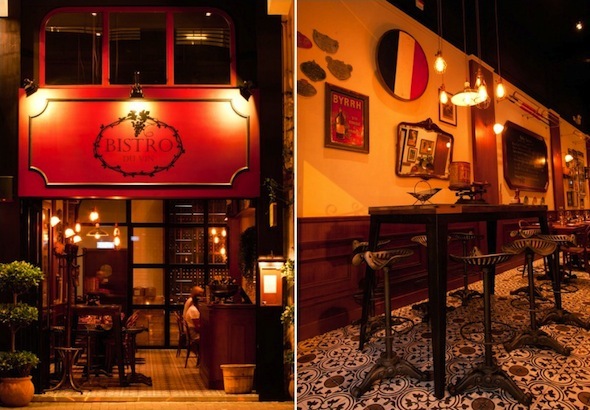 Bistro du Vin is worth the journey to Kennedy Town, and the quiet area adds to its charm. The relaxed atmosphere and quirky decoration is a definite draw, and the dishes are prepared with enough care to tell me that no detail has been overlooked. You can also read this review on Sassy. Categories: French | Tags: apple tart, Bistro du Vin, Bistro du Vin Hong Kong, bouillabaisse, Cepage, duck rilettes, French bistro, French cuisine, Kennedy Town, Les Amis group, pate, Piccolo Pizzeria | Permalink.